Home » Horn » Upgrade to Digital Music Reading: New Stand! So I’ve really been enjoying using my tablet as a digital music reader. It’s certainly been an adjustment (I’ve written about some of those here), but overall I really have been enjoying it. 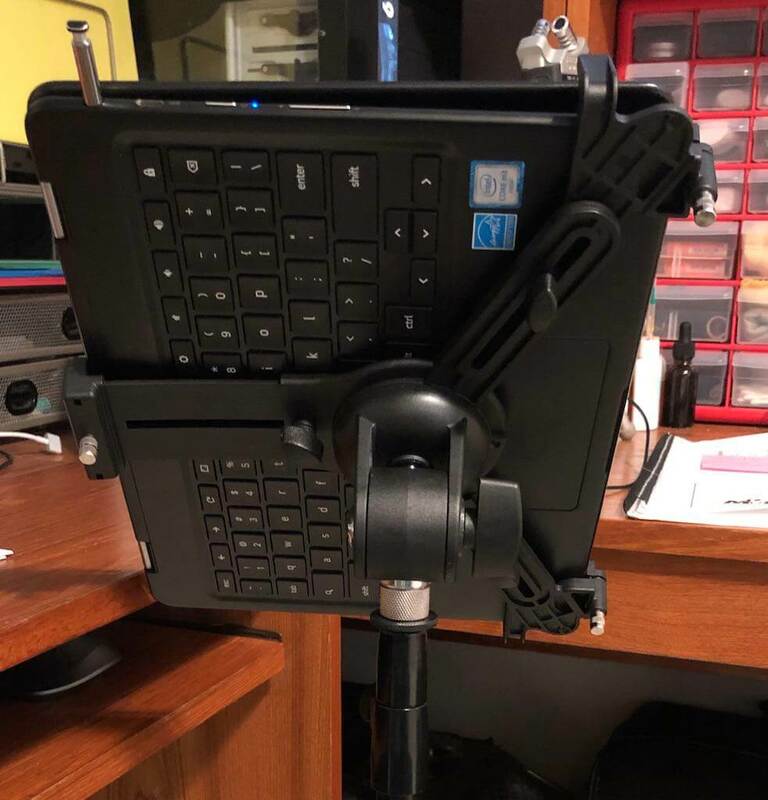 One recent upgrade that I made was for a relatively small and compact stand/tablet holder setup to fit in the car and use in situations where I would normally need to provide my own stand. 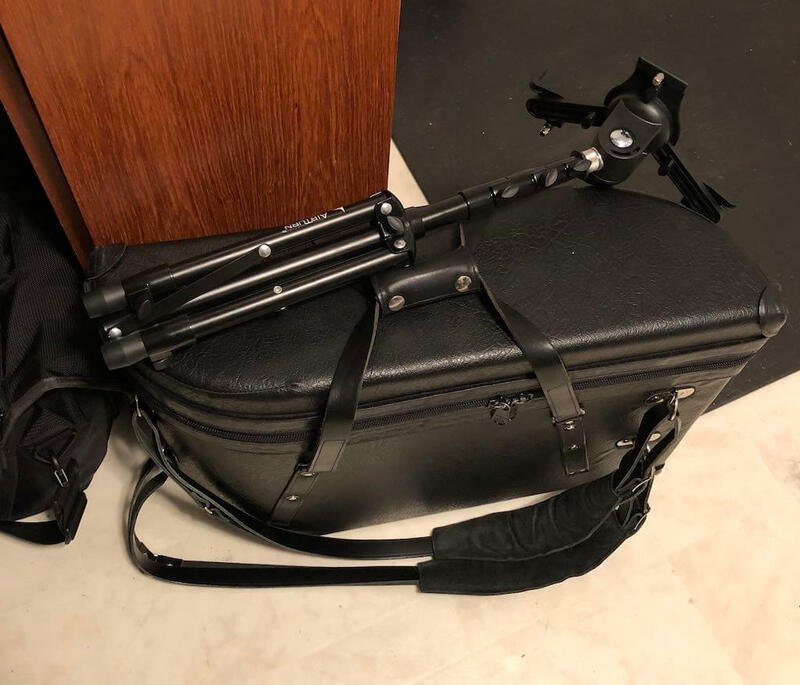 I have used a Peak Collapsable Music Stand as a travel stand, since it folds up into a fairly small travel bag, but there are a few reasons why I decided to upgrade. Number one is because the Peak stand was actually bought for my wife – she uses it in her teaching at home, and so that means that if I need it I have to both clean it off (and find a place to put her music) and also lend her my fancy double-decker Manhasset, which means that I have to clean off my stand! First world problems are real. The second reason for the upgrade is that since I’ve started to transition to using a tablet for music reading, I’ve noticed quite a few other people either asking about or making the same transition. 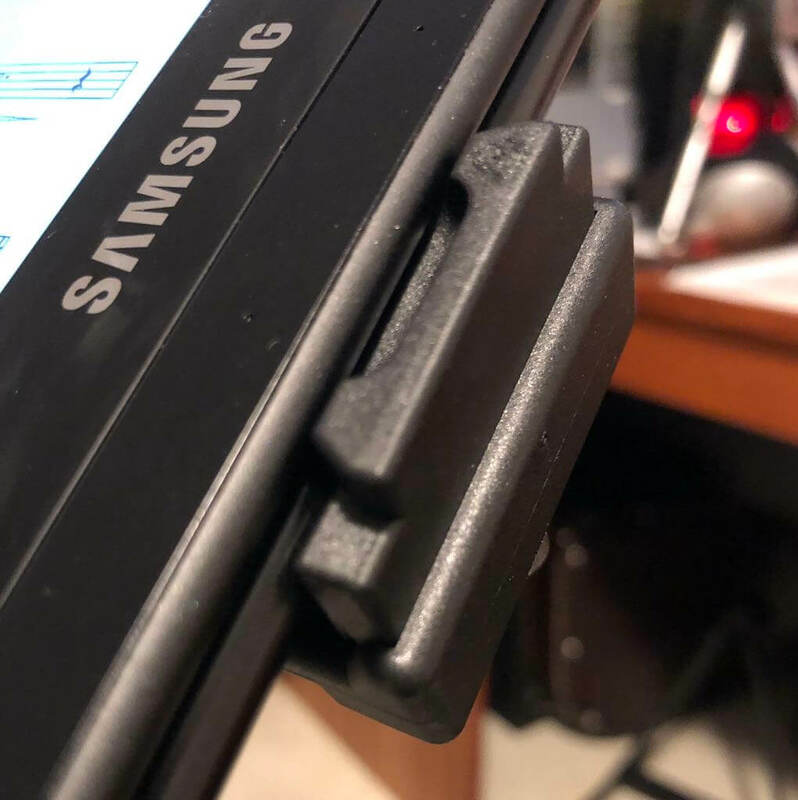 One of those musicians making the transition had a tablet holder that they couldn’t use (it wouldn’t fit an iPad with a thick case) and so they offered it to me. The tablet holder in question is this K&M model. Although it’s a bit complicated to adjust (I had to look up instructions to find the best way to get my tablet to fit), I was able to adjust it to fit my Chromebook (which is a bit thicker than an iPad) fairly easily. 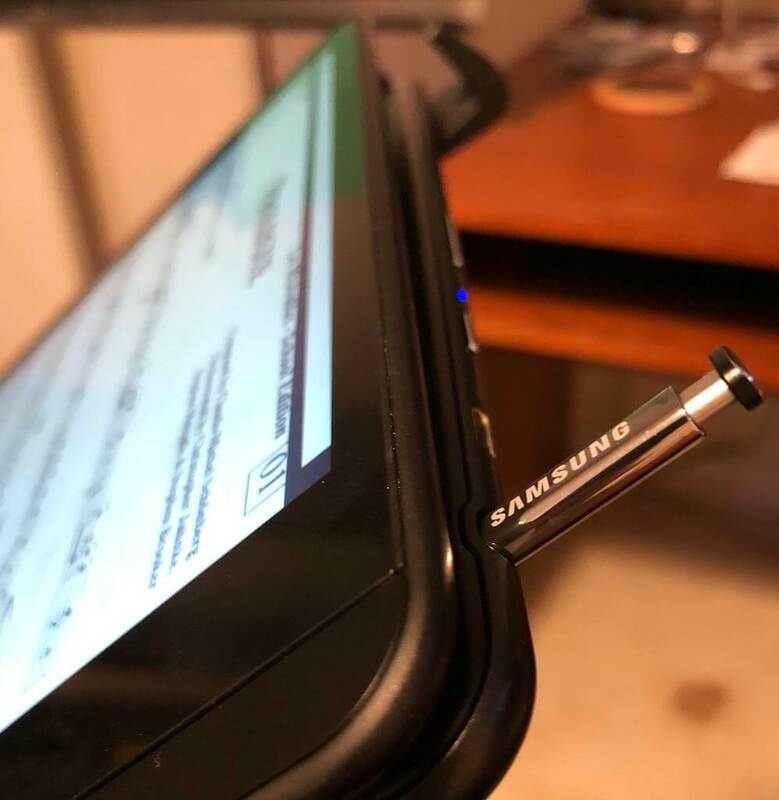 It can hold tablets in both landscape or portrait, and although the initial fit did take about 20 or 30 minutes, it does seem sturdy and the it holds those adustments with no problem. 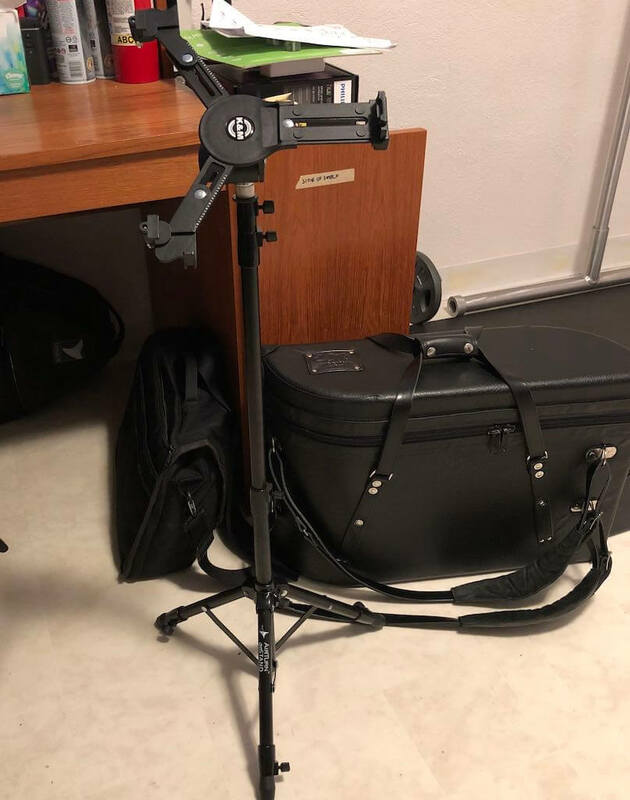 To hold the tablet holder, I wanted a mic stand that was relatively inexpensive and as compact as possible when folded up. 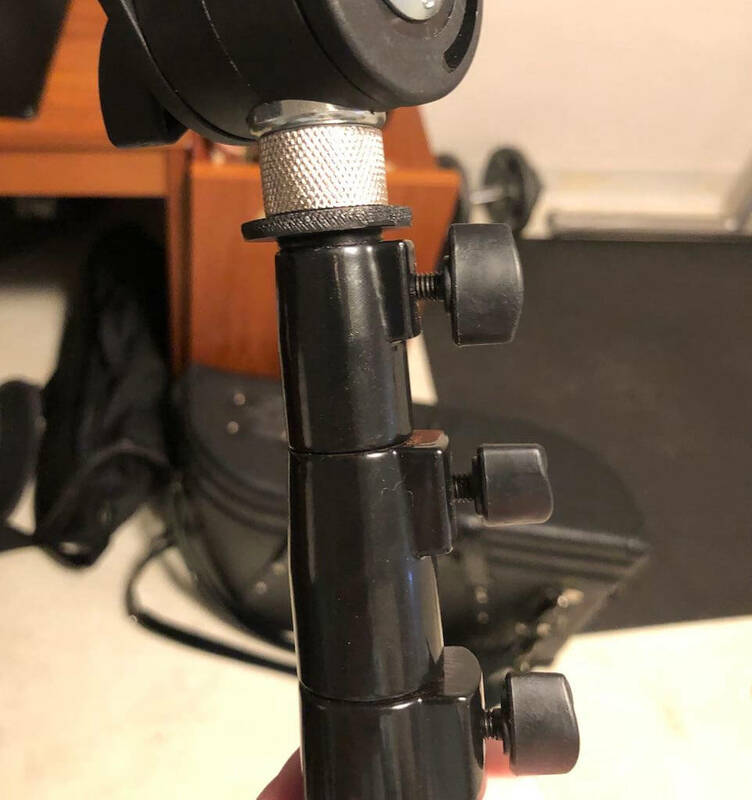 Although there were some fairly inexpensive models on Amazon, after reading reviews I eventually decided on this goSTAND Portable Mic Stand that looks like it’s made by the same company that makes my AirTurn pedal. The goSTAND wasn’t the cheapest option, but it collapse to a reasonably small size and seems sturdy enough. 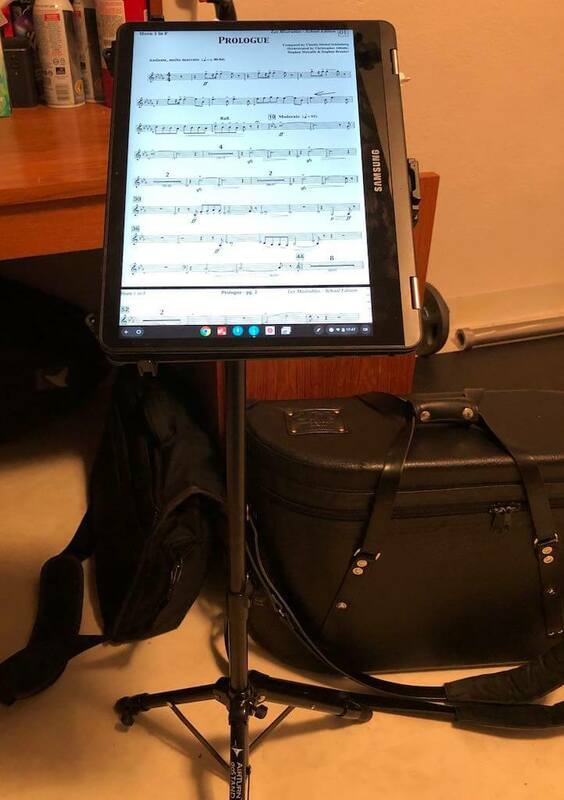 There are several different versions of the K&M tablet holder that feature different attachment mechanisms for different ways of attaching to a music stand. 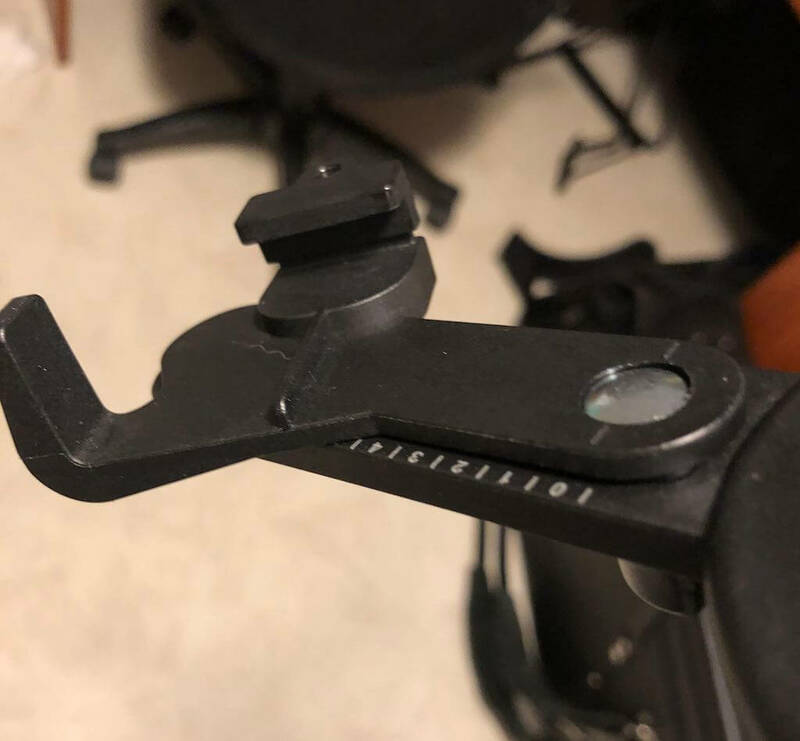 The version I have (and linked above) has a universal mount to screw on to the vertical portion of a music stand. They also make versions that can mount directly on top of a mic stand, or sit on top of a desk, or actually have the stand integrated as part of the holder itself. In all of these, the tablet holder seems to be the same, with the same adjustment range. Unfortunately, the length of the arm, the weight of my Chromebook, and the lightness of the goSTAND made the universal attachment…precarious. The stand would tip over at the slightest touch. 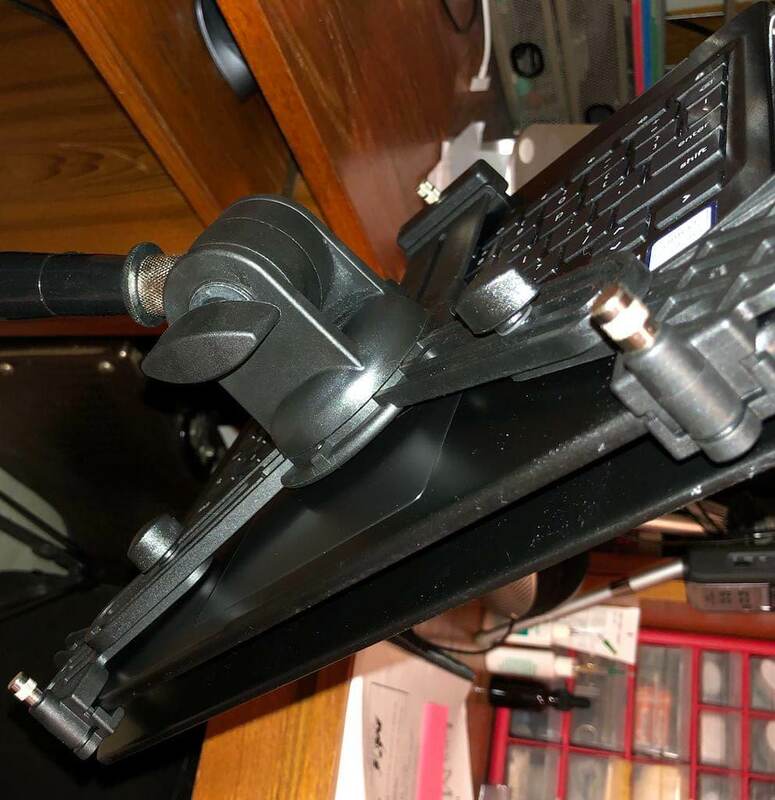 However, the arm of the K&M stand can be removed from the tablet holder, and the K&M can be screwed directly on to the top of the goSTAND. One small obstacle – the K&M tablet holder has 3/8 in. threaded connection, while the goSTAND has a 5/8 in. threaded connector. A quick Google search, and this small and inexpensive adapter solved the problem quickly and easily. I’ve used this setup a couple of times (mostly at home so far), and I’ve been pretty pleased with it. It’s not quite as small as a folded-up wire stand, but it’s so much sturdier. Once the tablet holder was set up, it’s also quicker to set up than the Peak Stand. Pictures of the K&M + goSTAND. Empty tablet holder + stand. Non-empty tablet holder (and stand). The back. It looks a bit…odd, for sure. Close up of the tablet holder, left hand side. There are some guide marks to easily collapse/resize the arms. 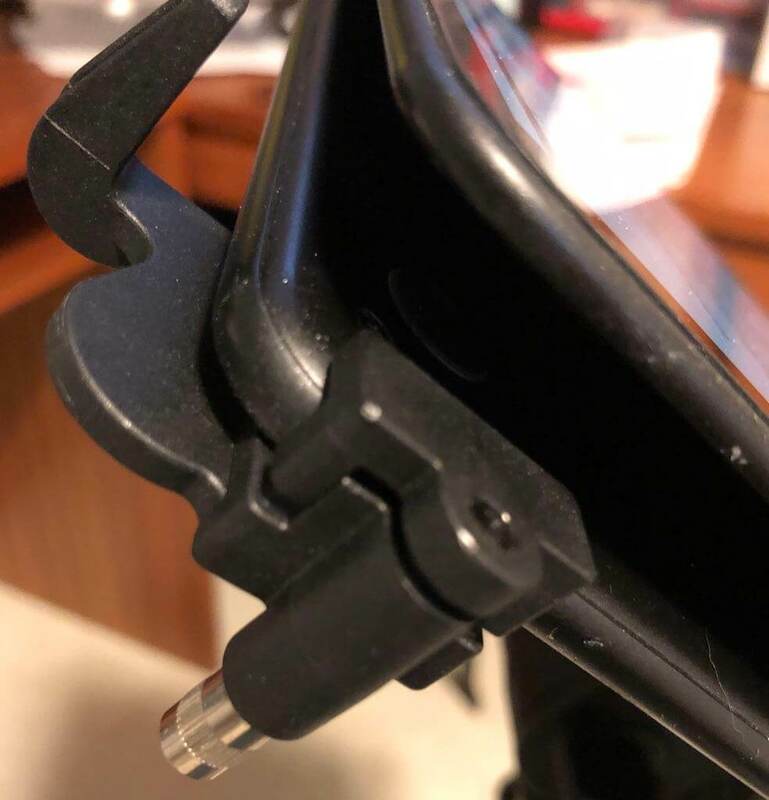 Close up of the right side of the tablet holder. The top. The buttons and pen are easily accessible. You can see the number of adjustments on the back. Another view of the back adjustments. Stand adjustment, plus the 3/8-5/8 adapter. Totally collapsed. It’s not the smallest, but it’ll do. If you’re in the market for a tablet-specific setup, these options may work for you. If you’re worried about adjusting the K&M to fit a thick case, there is also the Manos Tablet Holder (also made by AirTurn) that looks like it will fit tablets with thicker cases. 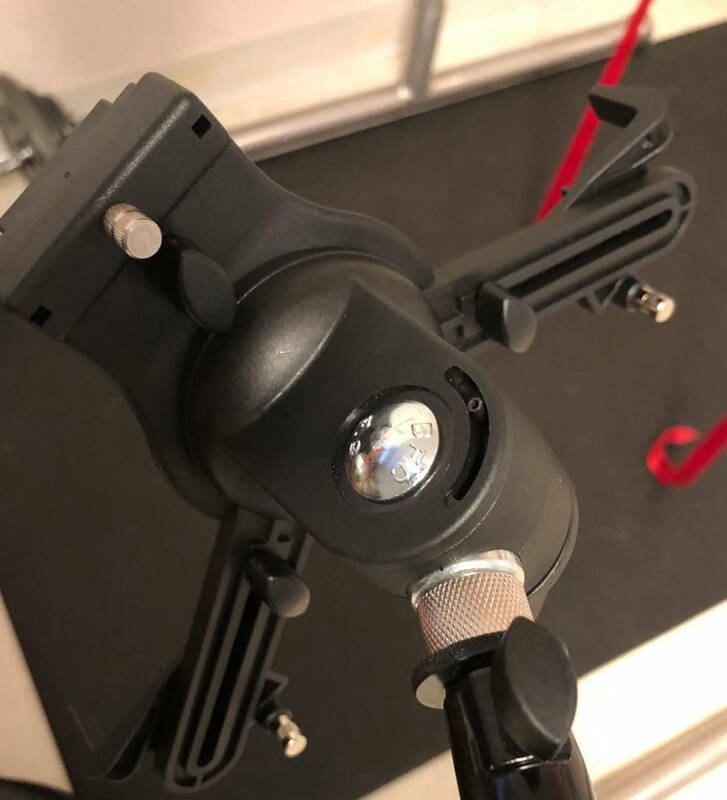 Like the K&M, the MANOS has options for a univeral mount with an arm, or a version that screws directly on top of a mic stand. These look a little bit easier to adjust than the K&M, and I’ve heard that they can accomodate thicker cases, so they may also be worth investigating.